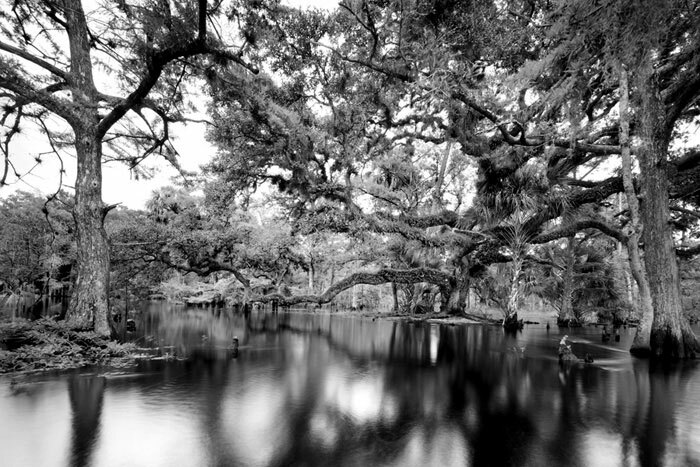 Originally trained as an architect, landscape photographer Clyde Butcher has been exploring and capturing the far reaches of nature for more than 40 years. 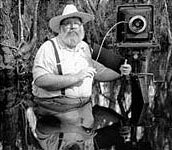 With his Deardorff, Wisner, and self-designed “Clyde-O-Wide,” Butcher hauls his unwieldy camera equipment (weighing 100-125 pounds) deep into the swamps of the Everglades, where he wades into the waters (and sits — for hours on end, with alligators and other critters) to catch eye-level, pure black-and-white images of such grace and beauty, that words cannot do them justice. I’ve been lucky to visit the Big Cypress Gallery, and stand in amazement in front of my favorite photographer’s enormous works. For years now, I’ve said that when my millions arrive … one of these pieces shall be my first purchase. C’mon, millions. Butcher will always be one of my heros — environmentally, spiritually, and artistically.